Orti Oricellari - FLORENCE LIVE! The villa building, erected in the late 15th century over a property bought by Nannina de' Medici, the sister of Lorenzo il Magnifico, and by her husband Bernardo Rucellai, is undoubtedly of particular cultural importance. Set amid the Giardino degli Orti Oricellari (or Rucellai Gardens), it is known to have hosted the Plato Academy, and to have attracted such personalities as Niccolò Machiavelli, Jacopo Nardi and Pope Leo X. Following the financial and political misfortunes of the Rucellai family, the property was sold in 1573 to Bianca Cappello, who restored the gardens to their former splendour. In 1640, the property once again passed into Medici hands as a result of a complex inheritance situation. The first main transformation of the garden dates back to the mid-17th century, when Buontalenti introduced new water displays and giant statues. Here, as in Pratolino though on a smaller scale, the atmosphere is Arcadian, and takes its inspiration from classical mythology. 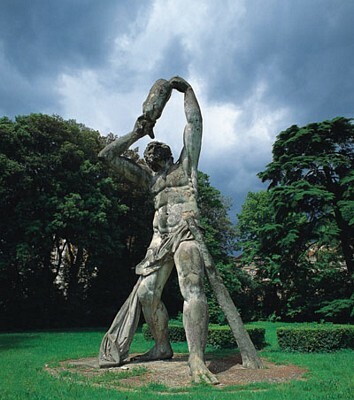 The Italian-style layout is enhanced by a highly theatrical effect culminating in the huge figure of Polyphemus drinking from a wineskin, sculpted by Antonio Novelli. The Garden Grotto, also the work of Novelli, is a cave decorated with sponges and statues in dynamic poses and representing the winds. The grotto consists of two communicating chambers, the first elliptical in shape, the second regularly shaped with frescoes of nymphs. The garden underwent a further transformation in the early 19th century, when marquis Giuseppe Stiozzi Ridolfi commissioned architect Luigi Cambray Digny to adapt the garden to the English style then in vogue. 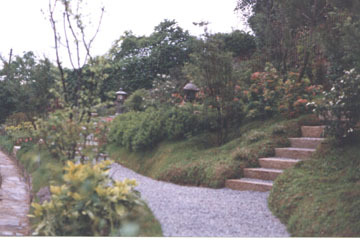 Though relatively small, the new garden (which was divided by the central avenue ending in the temple of Flora) was landscaped with winding paths, hillocks, small pools, statues and artificial ruins. Ancient elements dominated, and the statue of Polyphemus and the grotto were absorbed into the new layout. In 1861, the property changed hands yet again and princess Olga Orloff commissioned Giuseppe Poggi to modernise the villa and the garden. Poggi presented classical-style plans and reinstated the pool from which the statue of Polyphemus emerged. 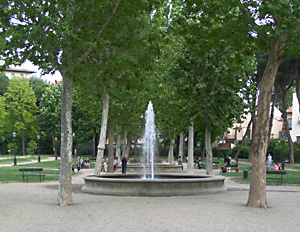 During the large-scale works carried out when Florence was capital of the Kingdom of Italy, the gardens were cut into two parts by Via Benedetto Rucellai. Generally speaking, however, few if any of the changes made after the creation of the new road altered the layout created by Giuseppe Poggi.